A modern fairy tale that combines knighthood and high school with swoon-worthy romance and fairy princes. This book captured my imagination from beginning to end. The faerie elements in the setting were simple but interesting, just creepy enough to give the story an ominous edge. The descriptions of the different fae were always gorgeous and captivating, and I loved that even though the world building for the faerie court was simple, it painted a picture of a much more complex society. Even though the town is filled with magical occurrences, the contemporary setting was realistic as well. A lot of books try to combine magic and high school, but this book actually succeeded. This book created not one, but two unique protagonists. Hazel’s character was a new twist on the (now somewhat stereotypical) YA badass female. She was a fighter, and had been since she was a child, but there was a clear reason (and some psychological damage) for her need to be a “knight.” The juxtaposition between being a warrior child and an intensely normal teenager was bittersweet and relatable (in a loose sense); we all wish we were as amazing as we thought we were as children. In Hazel, I saw a strong female character whose power came from inner conflicts and growth, not just her ability to wield a sword. Hazel’s brother, Ben, was unique in his own way. He wasn’t badass—not by any stretch of the imagination—but he was still complex and real. I loved his relationship with his musical side, as well as the fact that he wasn’t brave or reckless the way so many YA protagonists are. Though I’d love to be as strong as Hazel, I have to admit I’d act more like Ben, and I love that Holly Black was willing to create such a lovably flawed character. The romance in this book was perfect—it never overpowered the plot, but it was always there, pushing the story forward and helping the characters grow. Though there could have been an incredibly awkward love triangle, there wasn’t one, which I loved. Jack and Hazel are perfect for each other, and I loved the slow-release way that the reader realized how much they liked each other. Ben and the faerie prince’s romance was almost instalovey, but in the end, I understood their emotional connection, and I shipped them just as hard as I shipped Hazel and Jack. The only part of the book that I had a problem with was the pacing of the plot. The first half dozen chapters are mainly exposition, and throughout the book, much of the story is told through flashbacks. The pacing isn’t bad—it kept me reading—but if you are expecting a rapidly paced book, this isn’t one. I kind of was expecting a more dramatic plot, but once I settled into the way the story was being told, I loved it. The flashbacks always revealed new information, even the ones later in the story. There were a lot of OH MY GOD moments, and I loved the way that all of the layers of the story wove together. Every character got to have their own plot line, their own struggles, and their own growth; the story was able to tie everything together into a powerful and whimsical plot. Holly Black’s writing is simple but gorgeous, perfectly conveying the sinister but fairytale mood of the story. 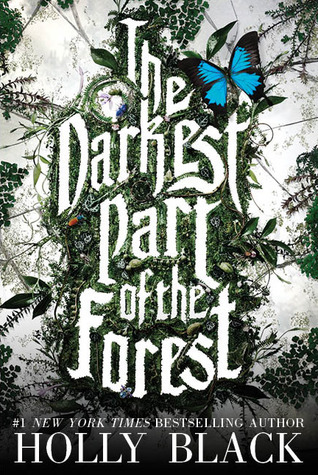 I would recommend this book to anyone looking for the elusive mix of really good contemporary characters with the darker elements of fairy tales. Each of the characters is vividly portrayed, and though the plot doesn’t race along at a breakneck pace, you won’t be able to put the story down. Guest of the Month Club: Five Books Sophie Wants to Read in 2016!